Paris (VNA) – A ceremony marking a year of cooperation between national flag carrier Vietnam Airlines and its French counterpart Air France was held in Paris on April 8. Director of the Vietnam Airlines Office in France and Europe Cao Anh Son said after a year of operation, the joint venture between the largest carriers of Vietnam and France is thriving, serving 355,000 passengers in 2018. 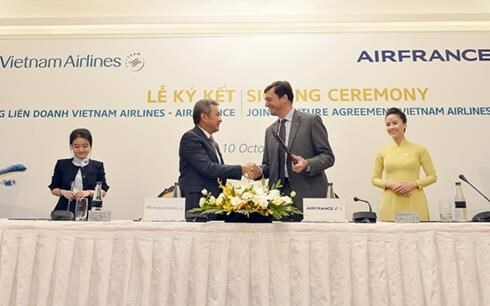 Sebastien Guillot, head of Air France’s marketing in France, said the joint venture contributes to affirming the position of the two airlines in the Vietnamese market. Officially launched in November 2017, the joint venture has enhanced services and connections thanks to suitable schedules of flights departing from Charles de Gaulle airport in Paris, Noi Bai airport in Hanoi and Tan Son Nhat airport in Ho Chi Minh City. After joining the SkyTeam airline alliance in 2010, Vietnam Airlines began to codeshare with Air France in flights between the countries. Previously, the carriers worked together for more than 20 years in aircraft maintenance and aviation human resource training.